The RH cylinder range is a series of double-acting cylinders, ranging from a 40 to 200 ton capacity, designed for the pulling and tensioning of cables, anchor bolts and forcing screws. Simple versatility of application is enabled through interchangeable piston heads. A built-in safety feature solves the problem of the retract circuit being over-pressurized. Ideal for pulling and tensioning of cables, anchor bolts, forcing screws - single-acting cylinders from the Centre Hole Range. 30 to 200 Ton double acting centre hole cylinders available with numerous interchangeable inserts for the piston head. 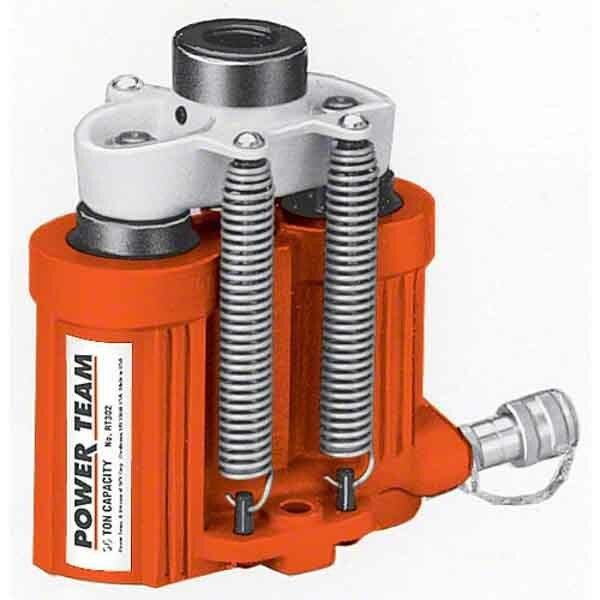 For applications where space is at a premium, these power twin cylinders ranges from 17½ -100 Ton in capacity. For a top of the range centre hole hydraulic cylinder look no further than the fantastic range available here at SGS. Discover precisely what you need and ensure your workshop is fully equipped with the correct centre hole cylinder by browsing the many options on offer. 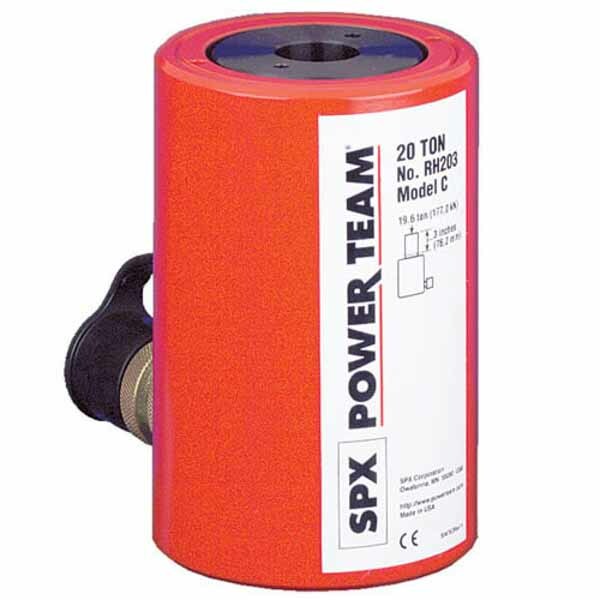 Single and double acting hydraulic cylinders as well as twin ones can be used for various purposes. 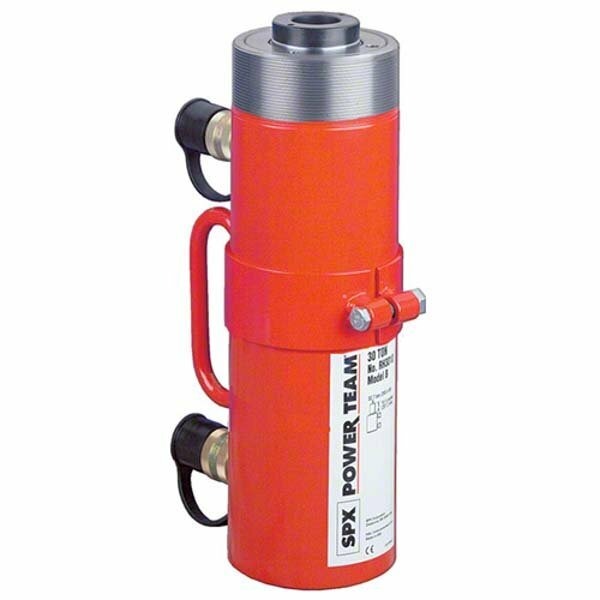 We provide centre hole cylinders from Power Team, one of the industry’s leading brands, and are proud to be Europe’s largest stockists of their products. More than 40 years of industrial use has helped develop them into the most efficient model possible and quality is guaranteed from such an esteemed brand. All the centre hole cylinders for sale courtesy of Power Team come with their lifetime Marathon Warranty, meaning they are sure to last and perform for a long time. Options to purchase or hire out can be found if you only require a centre hole cylinder temporarily. We take care of our customers so if you have a question or two about any centre hole hydraulic cylinder in our selection then feel free to get in touch. Someone from our friendly team will be more than happy to help and advise you if needed.